Aguas Buenas, commonly known as "La Ciudad de las Aguas Claras" ([ˈaɣwaz ˈβwenas], Good Waters) or "The City of Clear (Good) Waters", is a municipality of Puerto Rico (U.S.) located in the Central Mountain Range, north of Cidra, south of Bayamón, Guaynabo and San Juan; east of Comerio; and north-west of Caguas. Aguas Buenas is spread over 9 wards and Aguas Buenas pueblo (The downtown area and the administrative center of the city). It is part of the San Juan-Caguas-Guaynabo Metropolitan Statistical Area. Aguas Buenas was originally a sector of Caguas known as Aguabuena. In 1798, a group of residents started establishing their houses near some of the rivers in the area and started calling the sector Aguas Claras. The quantity of residents incremented with time and on July 25, 1832, they organized a meeting and commissioned Francisco de Salas Torres and Ramón Díaz to do the necessary arrangements for the region to be declared a municipality. A resident, Julian López, offered part of his estate to be used for the construction of a town square, a church, the city hall, and the priest house. The town was officially founded on May 25, 1838, and the name was changed to Aguas Buenas. Francisco de Salas Torres was declared the first mayor. Initially, the economy of the town relied on coffee plantations and commerce. At the end of the 19th century, the town's population was close to 7,000. In 1906, mayor Don José E. Morales bought nearly six acres of terrain from Don Guillermo Díaz Delgado. In these lands, the sectors of La Pajilla, El Pueblito and El Guanábano were established, expanding the town's area. 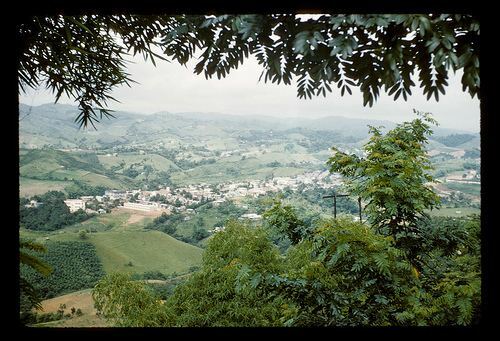 The terrain is moderately mountainous located in the Cayey mountain range ("Sierra de Cayey"), part of the Cordillera Central in Puerto Rico. The highest peaks are La Peña, Santa Bárbara, La Tisa, and La Marquesa. Several rivers flow through Aguas Buenas. Some of them are the Bayamón River, and several small rivers that are part of the Río Grande de Loíza, like Bairoa, Caguitas, and Cañas. 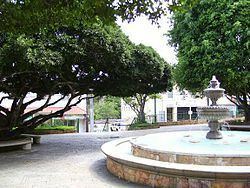 Some of the places of the landmarks and places of interest in Aguas Buenas are its town square. The Aguas Buenas Caves are also an important landmark, as well as the Palito and La Tiza mountains. Aguas Buenas has an amateur baseball team called the Tigers. Several festivals and annual events are held in Aguas Buenas. The Salsa, Bomba & Plena Festival is held in the late summer, while the Fiestas Patronales are held in September 8. There's also an Agricultural Fest held in May and the "Festival Folklórico de Campo y Pueblo" in January. The annual Carnival is also held in March. After its foundation, the economy of Aguas Buenas relied mostly on coffee plantations. Currently, Aguas Buenas is home to an important egg producer of the island called Del Campo. The company has over 180,000 laying hens putting out a daily production of 144,000 eggs. There are also several industries of ladies apparel and construction located in the town. As of 2010, Aguas Buenas has a population of 28,659. Although that represents a decrease of 373 when compared to 2000, its population had steadily increased since 1930. That year, Aguas Buenas registered a population of 12,885. According to the 2010 Census, 72.5% of the population identifies themselves as White, and 12.6% as African-American. Also, according to the census, the population is equally divided by gender (49% are males, while 51% are females). Finally, 25% of the population is under 18 years old. The next biggest percentage of population (19.4%) is between 35 and 49 years old. 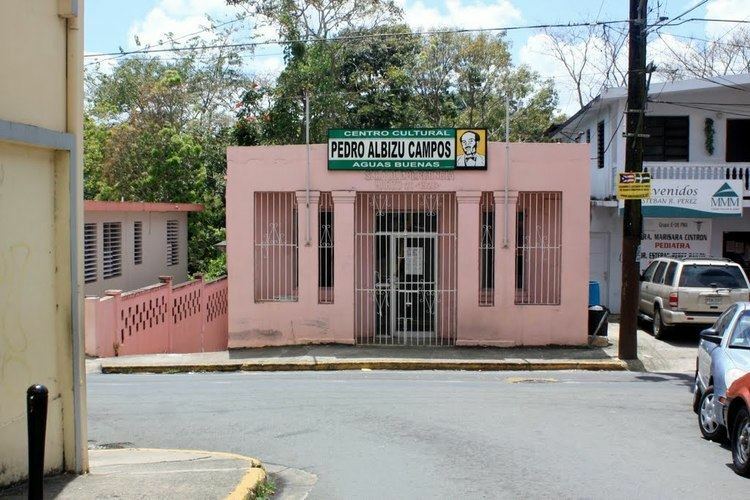 All municipalities in Puerto Rico are administered by a mayor, elected every four years. The current mayor of Aguas Buenas is Javier García Pérez, of the New Progressive Party (PNP). He was elected at the 2016 general elections. The city hall is located in front of the town square. Since 2011, the city belongs to the Puerto Rico Senatorial district I, which is represented by two Senators. In 2012, José Nadal Power and Ramón Luis Nieves were elected as District Senators. The flag of Aguas Buenas features a blue triangle with the base at the hoist. The triangle has a solitary white star, like the national banner. A second triangle appears interposed with the first one, in yellow, with its point reaching the other end of the flag. The main field of the flag, under both triangles, is color green. The coat of arms features a four-paneled shield. The upper left panel shows the Virgin of Monserrate, while the upper right panel features a Taíno, a symbol of the original inhabitants of this region. At the bottom right panel, lies a cornucopia containing the native fruit of Aguas Buenas. This panel represents how the agriculture was the primary source of income for the town. In the lower left panel, there are four maracas and a güicharo, typical instruments of the "jibaros" of Aguas Buenas and Puerto Rico. The crown, as with other municipalities of Puerto Rico, consists of three towers. To reach the town of Aguas Buenas, visitors must take the Puerto Rico Highway 52 to the city of Caguas. From there, road #156 leads directly to the town square. Other roads lead to nearby towns like Comerío. Aguas claras Alma limpia del Coquí, Orgullosos hijos tuyos, Por haber nacido aquí. Indio noble que en cueva nuestro pueblo verde vió. La Cruz de España en tus venas, rítmico grito africano nuestra estirpe delineó. Tus femeninas montañas, plenas de café en flor, cristalinas aguas bañan, como concierto de amor. Cabeza de cordillera, rostro de nuestro país, el cuatro, triple le cantan, tierra fértil de abundancia, de frutos puros de aquí. Gente clara, gente buena son tu corazón le aman, viva Aguas Buenas ¡Aguas Buenas para mí!